Electronic Health Records. Improve health and safety. CampDoc.com is the leading electronic health record system for camps. Designed by camp doctors, nurses and directors, our secure, easy-to-use web-based solution manages health forms, allergies, medications, and illness/injury tracking for your camp throughout the summer. 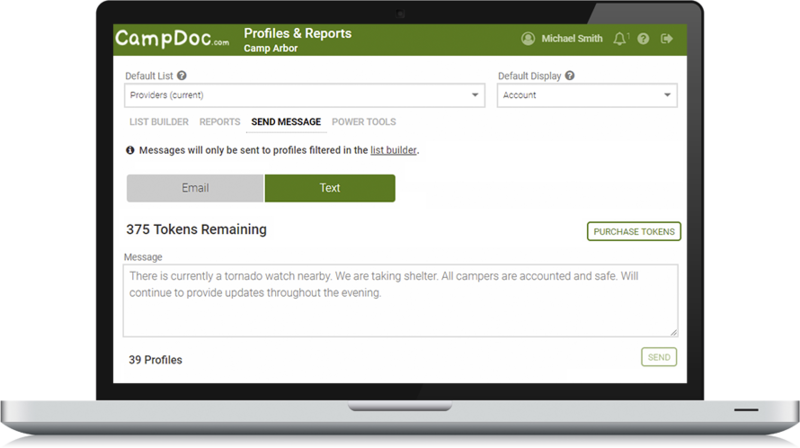 CampDoc.com provides camp health staff instant access to vital medical information, decreases the time and energy spent during initial camper check-in, reduces risk and liability, and helps keep safety in the forefront of camp operations. Higher quality, complete documentation that is legible and organized, will make your camp clinic more efficient and help your staff avoid mistakes. Electronic medication administration will help reduce preventable medication errors. Our electronic health log can analyze illness and injury in real-time to help you reduce risk. What the heck is an eMAR? Relying on handwritten instructions when dispensing medications to campers and staff can be dangerous. The eMAR, or Electronic Medication Administration Record, from CampDoc.com minimizes the potential for human error, and has raised the standard and quality of care delivered at summer camps throughout the country. The CampDoc.com eMAR aids summer camps in documenting when medications are given to campers and staff, and ensures that they follow the “five rights” of medication administration – right patient, right drug, right dose, right time and right route. Oh, and it will also alert you electronically if you forget to give a camper their medications! Do You Like Reports? Yah, Us Too! It’s simple. Create a report for any piece of data you collect. Does your unit leader need a list of all of their campers with food allergies? Or maybe a counselor needs a list of their campers taking breakfast medications? Find answers easily and take action instantly. Stay up-to-date with custom reports that you can build on your own. Select the questions, pick the group, set filters, and get an instant report. Print your reports or download them as a PDF or Excel file. Our platform supports different report formats, each with varying degrees of functionality and complexity. CampDoc.com was designed by camp doctors, nurses and directors and is loaded with tons of features. We love feedback, and listen to our users and integrate their feature requests on a regular basis. Send automatic reminder emails to your families if they have an incomplete camper health form. Track email open history and bounced emails. Pre-populate camper health forms so families don’t have to start from scratch every year. Filter for specific campers or staff to create lists or generate reports. Save frequently used lists and access previously saved lists instantly. Review camper and staff profiles in real-time, and keep track of health records that have been reviewed or those than still need to be. Add internal notes to a camper or staff record, and track notes by category and priority. Add tags to a camper or staff record to keep track of internally assigned items (e.g. cabin/bunk). When a disaster or emergency hits your camp, you need technology that facilitates rapid notification. Text message alerts from CampDoc.com allows camps to easily send mass notifications and emergency communications. Many families and staff now prefer text messages over email communication for important camp announcements as well, and we use the latest technology and broadcast network to send large volumes of messages reliably and quickly. Our camp management and electronic health record software includes multimodal messaging capabilities so camps can instantly launch alerts via text and email. Establishing an emergency procedure for your camp is critical, but effectively communicating these procedures to your camp families and staff is just as important. Camps need to think more critically about their disaster and emergency planning, and put these plans directly in front of camp families and staff. We know that many camp participants speak different languages, and camp directors and camp nurses often struggle with language barriers when trying to capture accurate health information for these campers and staff. CampDoc.com can be customized to support multiple languages. With multilingual support you can create and manage translations for all of the content in your health profile. Families can toggle the language display when completing their health forms, reducing the risk of miscommunication. CampDoc.com allows you to log clinic visits in a centralized, easily accessible and secure environment that is flexible and easy-to-use. Knowing the time and energy that many camp clinics put into the American Camp Association or state/county health log requirements, we wanted to make logging clinic visits more efficient and most importantly, useful. We follow the standard SOAP note format (an acronym for subjective, objective, assessment, and plan), a widely adopted communication tool between inter-disciplinary healthcare providers. Physicians, nurses, EMTs, physician assistants, nurse practitioners, pharmacists, and physical therapists, among other providers use this format to document a patient’s initial visit and to monitor progress during follow-up care.